Baird Country Girl Kabocha Ale is a 6% fruit beer from Baird Beer that is part of their Autumn seasonal lineup of beer. The name Country Girl stems from the personal history of Bryan Baird himself and is a homage to his mother. Kabocha differ from the usual pumpkins found in the west with hard green skins and is sweeter than often eaten. Baird Country Girl Kabocha Ale is on sale from annually October 23rd and can be found in both bottles and on draft at all Baird Taprooms. Autumn often brings special coloured beers with it and also beers with interesting flavours. 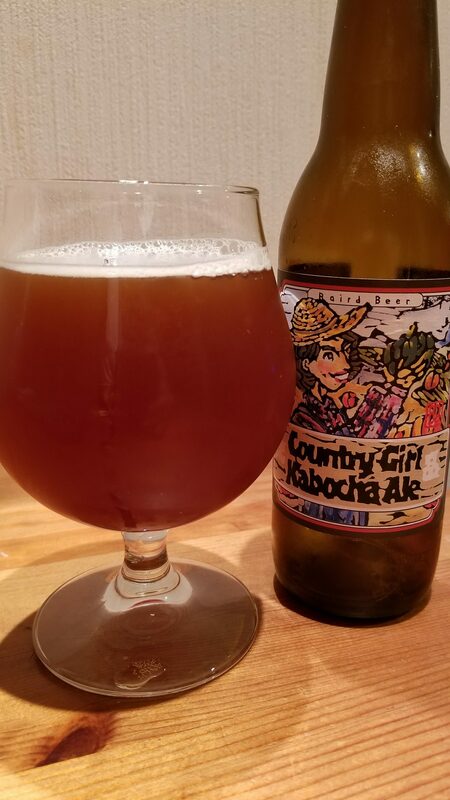 Baird Country Girl Kabocha Ale, specifically the kabocha, is often associated with the colder climes and can be found in Autumn cuisine up and down the country. The beer poured out a deep bronze colour with a significant amount of haziness to it though it lacked any head soon after pouring. It had a slight sweetness to it that reminded me of the kabocha along with a hint of caramel malts to it as well. The sweetness carried on through to the body of Baird Country Girl Kabocha Ale with the malt also making an appearance as well. While not as strong as the US pumpkin beers, there was a definite autumnal feel to it that lingered. The pumpkin also brought a slight creaminess that produced a smooth tasting beer right through to the aftertaste. I would have liked more complex flavours from Baird Country Girl Kabocha Ale but it was nice to try a pumpkin beer that isn’t doused in spices and herbs.